Preheat the oven to 350 degrees. Place a 9-inch tart pan with a removable bottom on a rimmed baking sheet. Set aside. Make the chocolate crust: In a food processor, pulse together the chocolate sandwich cookies until you have a coarse crumb. Drizzle in the melted butter and pulse until combined and you have a sandy crumb. Spoon the crumbs into the tart pan and use your fingers to gently press the mixture into an even layer on the bottom and sides of the pan. Follow with the flat bottom of a measuring cup or glass to firmly pack the crust into the pan. Bake for 8 minutes, until the crust is just beginning to set. Remove from the oven and set aside while you prepare the filling. The tart shell does not need to cool completely. Using either the microwave at 50% bowl or a double boiler, melt the butter and chocolate together in a large bowl, stirring often, until smooth and creamy. Set aside. In a large mixing bowl, whisk together the maple syrup, eggs, brown sugar, vanilla, and salt until combined. Slowly pour the melted chocolate into the custard mixture while whisking quickly to fully combine. Pour into the tart crust. Top with the pecans in an even layer. Bake for 18-22 minutes until the edges are set and the center is still slightly jiggly. The filling may gently puff up, but will settle down as it cools. Remove from the oven and let cool completely on a wire baking rack, 2-3 hours. Serve with a dusting of confectioners sugar or a dollop of fresh whipped cream. Enjoy!! ¹ Be sure to include the filling as well! ² I like to use a 70% cocoa chocolate bar for this tart but go with your favorite! 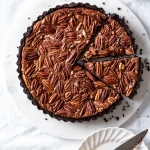 ³ Whole pecan halves look prettier, but the tart tastes better with smaller pecan pieces (and is easier to slice). I compromise by using equal parts of each.